Is my child ready for singing lessons? Should I sign them up? Who should they study with? 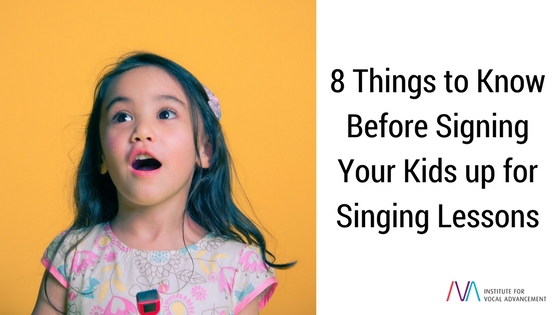 Here are 8 things you should know to help you decide whether singing lessons are the right fit for your child. 1. When should my child start singing lessons? I always say, “The sooner the better!” The American Academy of Teachers of Singing previously advised that children hold off on starting lessons until they have fully matured, but in 2002, they agreed that it is better to start teaching a child proper technique as early as possible to prevent them from forming unhealthy singing habits. If we start kids off with proper technique at a young age, we give them a solid foundation of healthy singing that will last a lifetime. The fact of the matter is, kids learn by copying! If they enjoy singing, they will copy the singers on the radio, right? Well, if we don’t teach them to do this properly – in a way that is healthy for their developing voice – then we really do them a disservice. Another thought to ponder: Vocal cords are like muscles; we train them to have muscle memory. Just as we train the greatest athletes at a young age, we can do the same with singers. As the voice is developing, we can start the same initial training that athletes do, but for the voice. 2. Does my child enjoy singing? There is nothing worse than being forced to participate in something you don’t like. If your child shows an interest in singing and sings around the house or in the car, they definitely should take some lessons and cultivate that interest and talent! But “making” your child take lessons just because you think it would be a good thing for them to learn is a bad idea. Don’t do it! We don’t want kids to form a bad relationship with their singing voice because they don’t want to be in lessons. Let them discover their passion for it. You can help lead them there, but don’t force it upon them. 3. Is my child the next singing legend? Sometimes as parents, we think we shouldn’t put our child in something unless they are absolutely incredible. But that is kind of silly if you ask me. Any level of talent is still talent! When it comes to the voice, each singer has a level of raw natural talent and a level of trained talent. We can’t really do much to change the raw talent, but we can definitely add to the trained talent. That is what singing lessons do. They can give anyone the ability to learn how to sing, even if they aren’t the next radio star. Singing lessons are so beneficial for any level of talent. They give insight on how to utilize this instrument inside of you that, if not trained and developed, could forever remain a mystery. So if they have an interest in it, give them the opportunity to learn how to sing. 4. Are you and your child ready to commit to regular practice routines? Just like anything, improvement occurs during practice. Now if your child is in sports, they usually go to practice a few times a week, run their drills and exercises, and come home. Unless you’re the coach, you probably don’t even think about their practice time on the field or having to run those same drills at home. But with voice lessons, they must practice on their own at home to see improvement. Your child will need to make time in their schedule to practice and solidify what they learned in their voice lesson that week. You will need to check in with your child to make sure they are keeping up on their singing practice. This will allow them to get the very most out of their voice lessons experience. 5. How do I know the teacher is the right fit for my child? Does the teacher understand the vocal development of children? Understanding the developing voice is crucial to knowing how to teach a child. If the teacher isn’t aware of all the changes a child’s voice goes through and how they differ from an adult voice, they may not know how to teach a child in a healthy way. Children’s voices have some limitations that adult voices don’t, and if the teacher is trying to make your child sound like an adult, it is more than likely the wrong approach. We want children to discover their voice instead of altering it to sound like someone else’s. Find a teacher that teaches your child to sing in a way that is natural to their individual voice. Is the teacher’s personality fun and motivating? The personality of the teacher will make or break the experience. Your child needs to feel excited, motivated, and comfortable with the teacher for them to fully succeed. Make sure your child enjoys the teacher and the experience. Does the teacher have experience teaching kids? Find a teacher that enjoys teaching kids and has experience doing so. If they only teach adults, they may not know how to change their teaching style to be on a kid’s level. 6. How long should each lesson be? Voice lessons are usually broken into 30, 45, and 60-minute sessions. It would be best to start with 30 minutes and then discuss with the teacher how your child’s attention span is and if they would benefit from trying a longer lesson. 7. How much will it cost me and is it worth it? The price of lessons depends on the teacher and their experience. They can range anywhere from $25 to $100+ an hour (USD prices). Whatever the price is, you must remember it is an investment! You are investing in your child learning the outcomes of hard work and effort. You are giving them the opportunity to learn a useful skill that they can feel accomplished in forever. To me, that is priceless! 8. How can I be supportive of my child’s singing growth? Remember, your role as the parent is to be the support team and your child’s biggest cheerleader! Cheer them on when they practice, give them compliments to encourage them to continue their growth, but please do not be critical of your child and the way they sound. You are paying a teacher to do their job of training your child, so discuss any concerns you may have about the way your child sounds with the teacher. I have seen parents try to be a child’s voice teacher in the home, and this can get very confusing for the child. They hear their parent (who probably doesn’t know much about singing) giving them advice that could be contradictory to what the teacher is trying to achieve that week. Finding your voice is a process. It won’t always sound perfect; in fact, it will probably sound quite the opposite for a while as they learn and grow, but they’ll get there. Listen to them practice with reassuring, loving ears, and try not to point out something they have done wrong. Remember, that is what the teacher is for. Let them tell your child what and how to improve. You can always reinforce what the teacher is teaching if you’d like to be more proactive. Children will always seek approval from authority figures such as teachers and parents. If they have battling feedback from both parties, it can get overwhelming. Support the teacher in what they are teaching your child, and if you aren’t pleased, take it up with the teacher. First and foremost, encourage and cheer on your child – they value your opinion more than you will ever know!